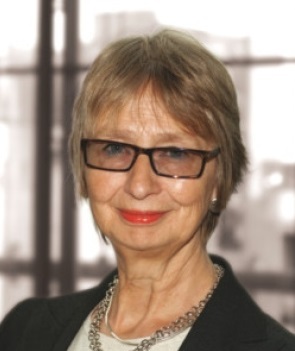 Jean Urquhart has spoken out against the radical anti-immigration plans announced by David Cameron this morning, and pledged to investigate ways the Scottish Parliament could resist some of the proposals. In a speech at the Home Office, Cameron said the Queen’s Speech next week would include measures to create a criminal offence of ‘illegal working’ and confiscate the wages of undocumented migrants, adopt what he called a “deport-first-appeal-later” approach to immigration appeals, and make landlords and banks investigate the immigration status of tenants and customers. “His plan for a criminal offence of ‘illegal working’ is nothing less than a back-door way of criminalising undocumented migrants. If undocumented migrants working in our businesses and contributing to our economy really was the problem he claims, he would punish the employers, not the migrants. “From Legal Aid cuts to employment tribunal charges, the Conservatives in government have made a concerted assault on access to justice and today’s speech continued that effort. His plan to deport undocumented migrants without appeal, forcing them to attempt to appeal remotely from another country, radically reduces the chance of a fair hearing. “Cameron’s plan to turn landlords into immigration officers by making them investigate their tenants, and to automatically cancel tenancies when visas expire, seems to cross the line from immigration policy to housing policy – which is a devolved matter. So I will be looking into what the Scottish Parliament can do to protect our migrant tenants from suffering this intrusion and threat of homelessness. Jean launched Not My Xenophobia in March, inviting Scots social media users to name-and-shame examples of xenophobic language, stereotypes and attitudes they see being used by newspapers, adverts, TV programmes and politicians. 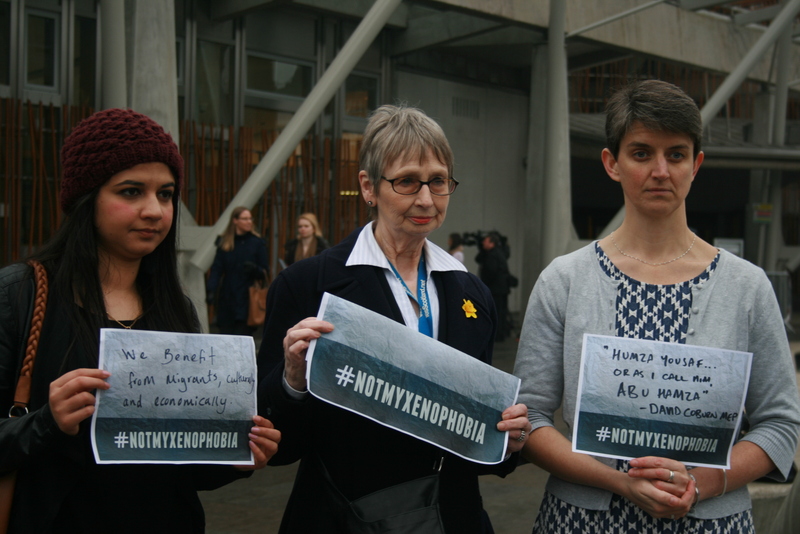 You can take part in the campaign by sharing any examples of bigotry and xenophobia on Twitter with the hashtag #notmyxenophobia, or on the campaign’s Facebook page, or by emailing jean@notmyxenophobia.scot. Yesterday at Holyrood, Jean followed up the Tuesday launch of the Not My Xenophobia campaign by leading a debate on a motion entitled ‘Celebrating Scotland’s diverse communities’. You can read the full debate, in which many MSPs pledged their support to the campaign, in the Parliament’s Official Report. On this page you can watch the video of the debate, starting at 1:09:00, and read Jean’s opening speech. There was an unusual display of unity after the debate, as MSPs voted unanimously to approve the motion, and to add both the Labour and SNP amendments. In a world that is more interconnected than ever and in which historically our societies have developed as a result of the transnational mobilisation of cultures and peoples, it is intellectually moribund that we rarely hear politicians or the media make the positive case for immigration. It is with alarm that we are witnessing the development of increasing hostility, xenophobia, discrimination and intolerance towards immigrants. I am gravely concerned that the tone of public discussion about immigration is contributing to a climate of hostility and fear. In this regard, we risk facing a race to the bottom. It is, it seems, politically fashionable to oppose immigration and, increasingly, the whole concept of multiculturalism. I am proud today to be one of those who are making the positive case for immigration, and who are highlighting not just the economic benefits but the cultural enrichment that flows from embracing it, rather than proposing an agenda that is set on creating resentment and division. I stand as an advocate for multiculturalism who recognises the benefits of viewing integration as a two-way process, in which we learn and develop from our fellow citizens who hail from other countries and who bring with them their own heritage and traditions. The world is a more interesting place and our communities are made more vibrant and outward looking if we encourage understanding and tolerance and adopt a welcoming attitude to immigrants as citizens in equal partnership. We barely hear such arguments. Instead we are faced, on a daily basis, with a toxic barrage of headlines demonising immigrants and an increasingly xenophobic politics that stems from the UK Independence Party but now, it seems, is infecting the mainstream parties, particularly in Westminster. The whole debate has been shifted rightwards, as it becomes increasingly popular to make opposing immigration a political principle. Even those who might have stood up for multiculturalism in the past find it difficult to do so now. That tide must turn, and we must challenge ourselves to testify for a modern, inclusive and humanitarian approach to immigration. Of course, Presiding Officer, the scapegoating of immigrants at times of economic crisis is nothing new. Throughout history, immigrants have been a useful section of society for powerful interests to blame in order to rationalise their own failures. Far better that our attention is focused on blaming immigrants for the lack of job opportunities and deteriorating living standards than on our unbalanced economy or corruption in the banking sector—or indeed the political establishment. The economic facts, which are rarely exposed, show that, rather than representing a drain on Britain’s finances, European migrants made a net contribution of £20 billion to the Exchequer between 2000 and 2011. However, it is in these circumstances that organisations such as UKIP thrive. They build on the fears that emerge as a result of economic precariousness and on the anti-immigrant sentiment popularised by sections of the media. The two have a near-symbiotic relationship, all set within a policy framework that has been shifting away from embracing multiculturalism and immigration for many years, under successive Westminster Governments. UKIP now advocates the scrapping of the racial equality laws, a move that would regress race relations by decades. Unless partisans of diversity and racial equality make the positive case for immigration—challenging though that may seem—we risk sliding down the slippery slope of an inward-looking xenophobia. That is a xenophobia that detracts from our culture, economy and the important sense of human solidarity that has always been the bedrock for making progress in society. I believe that the majority of our population can be won to such a perspective if only we unite our voices to amplify our case beyond the parameters of the current stale, stultified and one-sided debate. We so often hear the tiresome mantra, repeated throughout the decades, that immigrants are “stealing our jobs”. We should ask why the jobs market is so poor, how it came to be that our society is so unequal and why access to well-paid jobs is so privileged. We hear of immigrants “taking our houses”, but we must ask why our housing stock is so inadequate and underfunded, and why we do not put the necessary investment into building more high-quality, affordable homes. Why not inquire further, with a critical mind, to unearth beneath the waves of anti-immigrant headlines just how much of a contribution they make to our country? Let us talk about how much our communities have gained from immigration—all the doctors, nurses and public servants who help us in our time of need, and without whom we would be much worse off. Let us talk about the music scene or our constantly renewing creative culture and the extension of our palate into the world as each period of immigration—if embraced—emboldens our human need to experience more than ourselves, and to explore the things that we do not yet know about, in the pursuit of knowledge. Immigration, far from being a burden, is a gateway. We in Scotland should know that. Surely it is part of our DNA. Scots are immigrants. They are dispersed around the globe, where they have found and created work and shared their culture and made their home in another country. We should be among the first to recognise that the flow of immigration adds momentum to the progressive aspects of human history, and excites the potential in all of us, regardless of where we were born. Thus, I share the Scottish Refugee Council’s concerns at the recent poll conducted by BBC Scotland on Scottish attitudes to immigration, and I have signed Christina McKelvie’s motion questioning the methodology, outcome and timing of the poll. I was taken aback, listening to BBC Radio Scotland’s morning news programme a few days ago, to hear the Spanish immigrants in Inverness referred to as an “invasion”. For many, that confirms that the BBC is not acting impartially. It is time for a wholesale change in approach to how we discuss immigration and realise its benefits. I do not just want our Polish friends to be able to learn English—I want Scots to be able to take advantage of the diversity in our population to learn Polish. Imagine how our nation might develop were we to cut through the headlines of the Daily Express and Nigel Farage’s false narrative and recognise the potential that exists. Is it not time to move on as a society? We must stop repeating time and again the age-old fallacies around immigration, and move to a period of enlightenment where, rather than creating fear and division around difference and the scramble for resources, we work together to solve the economic problems we face and, at the same time, enjoy our distinctive and valuable cultural identities. UKIP is said to be making a “bold stand” on immigration. The truth is the opposite. It is those who stand up for the rights of immigrants and champion the benefits that they bring to a multicultural society based on social progress that are the 21st century’s trailblazers. It is time to show that there is a difference between the Scottish Parliament and the Westminster Parliament, by making and profiling the positive case for immigration and celebrating Scotland’s diverse communities. Please support the motion. That the Parliament believes that Scotland’s diversity should be celebrated and rejects the negative attitudes expressed in the media and politics toward immigration and immigrants; also notes with concern the impact of these attitudes in the context of the approaching general election; believes that there should be recognition of the very real and positive contribution made by immigrants from all over the world to Scottish society, culture and history; also notes that the Scottish population is comprised of a rich mix of peoples and cultures from all over the world and believes that all immigrants and their descendants are an integral part of the Scottish identity; calls on politicians and the media to stop the demonisation of immigrants, and calls on media outlets to take a more responsible approach toward their reporting of immigration to Scotland and the UK. Today at the Scottish Parliament, Jean launched Not My Xenophobia, her new campaign to challenge xenophobic attitudes in politics and the media. Not My Xenophobia invites Scots social media users to name-and-shame examples of xenophobic language, stereotypes and attitudes they see being used by newspapers, adverts, TV programmes and politicians, using the hashtag #notmyxenophobia. You can follow the campaign at the website www.notmyxenophobia.scot, the @notmyxenophobia Twitter account and the campaign’s Facebook page. Jean Urquhart was inspired to create Not My Xenophobia by the success of the #everydaysexism social media campaign, and the Scottish Government’s See Me campaign against mental health stigma. “From exploitative programmes like Immigration Street to the UKIP MEP David Coburn’s disgusting, racist comments about Europe Minister Humza Yousaf, we are surrounded with xenophobic messages in politics and the media. “But speak to ordinary Scots and you will find a very different attitude. Most of us value our friends, neighbours and colleagues from all over the world. The xenophobia we are being bombarded with isn’t ours – it’s being imposed on us by people in positions of power and influence who want to set us against one another. “This influence is especially pernicious in the run-up to the General Election, as the big parties compete over who can be tougher on immigrants, never mind that immigrants are and always have been an essential part of the country those parties want to run. “I’ve started the Not My Xenophobia campaign to give a voice to the majority of Scots who reject these hateful attitudes, and to name and shame the media organisations and politicians who promote them for their own gain. “I’ve worked closely with the Polish community in the Highlands, and seen first-hand the real pain that is caused by xenophobic language, stereotypes and attitudes. The Polish contribution to Scotland has been huge, from the Polish soldiers who defended our east coast in World War II, to the nurses who support our NHS today. Newspaper headlines that scream about the ‘problem’ of immigration insult that contribution and promote discrimination and even violence. “The Scottish identity is defined by migration. Our own nation is a rich mix of peoples and cultures from all over the world, and Scots have settled all over the world in return. We are an exceptionally international country, and are better off for that. Jean was joined at the campaign launch by Roza Salih, the Glasgow Girls campaigner who came to Scotland as a child from Iraqi Kurdistan and is now Vice President for Diversity and Advocacy at Strathclyde Student’s Union, and Maggie Chapman, the co-convenor of the Scottish Green Party and councillor for the Leith Walk ward in Edinburgh, who is a South African citizen and grew up in Zimbabwe before coming to Scotland as a student. S4M-12677 Jean Urquhart: Celebrating Scotland’s Diverse Communities—That the Parliament believes that Scotland’s diversity should be celebrated and rejects the negative attitudes expressed in the media and politics towards immigration and immigrants; also notes with concern the impact of these attitudes in the context of the approaching General Election; believes that there should be recognition of the very real and positive contribution made by immigrants from all over the world to Scottish society, culture and history; also notes that the Scottish population is comprised of a rich mix of peoples and cultures from all over the world and believes that all immigrants and their descendants are an integral part of the Scottish identity; calls on politicians and the media to stop the demonisation of immigrants and calls on media outlets to take a more responsible approach towards their reporting of immigration to Scotland and the UK.